We all have to grow up eventually. There’s a grim air to that statement—it smacks of morbid cliché—but the inevitability of aging is a powerful motivator. It forces us to confront the decisions we’ve made thus far and confront our self-imposed stagnation. I don’t know if writer/director Noah Baumbach is a cynic but, like me, he is a critic. With While We’re Young, Baumbach takes a scalpel to generational differences, satirizing the superficiality of youth while exploring the difficulty of reconciling with age. Josh (Ben Stiller) and Cornelia (Naomi Watts) seem like a happily married couple in their forties, but the proverbial spark that brought them together has gone missing. They’ve decided against having children of their own after many unsuccessful attempts to get pregnant. Maybe that’s for the best; in the opening scene, they struggle amusingly to calm their friends’ crying baby to little avail. Their relationship also strains under Josh’s stressed efforts to free his new documentary from post-production hell. In one moment of introspection, they wonder why they’ve abandoned the eager, easygoing personas they once had. As chance and social commentary would have it, Josh teaches a college film course that piques the interest of Jamie (Adam Driver) and Darby (Amanda Seyfried), a hipster couple in their twenties. The two of them are walking fireworks of free spirit who quickly charm the middle-aged Josh and Cornelia. Jamie in particular is enamored with Josh’s work and reveals that he has documentary filmmaking aspirations of his own. Josh is won over by Jamie and Darby’s earnestness and spontaneity and just like that, Gen X hops on the Gen Y train against the busy backdrop of New York City. It’s worth noting that both couples are evidently financially comfortable members of “New York’s creative class.” Baumbach’s critique focuses on lifestyle differences rather than socioeconomic divides, offering perhaps a narrow view of modern urban living. In one of the film’s most remarkable sequences, Baumbach and editor Jennifer Lame cut between the forty- and twenty-somethings to compare their daily lives. A noticeable distinction begins to form; the older pair fills their lives with digital gadgets while the younger two fill theirs with analog tech. Josh and Cornelia have modern, polished furniture and décor; Jamie and Darby have a grid of typewriters mounted on one wall, tapestries adorning the others. Josh and Cornelia watch movies in bed on an Apple TV while Jamie and Darby play worn VHS tapes on a tiny cube-shaped television set. 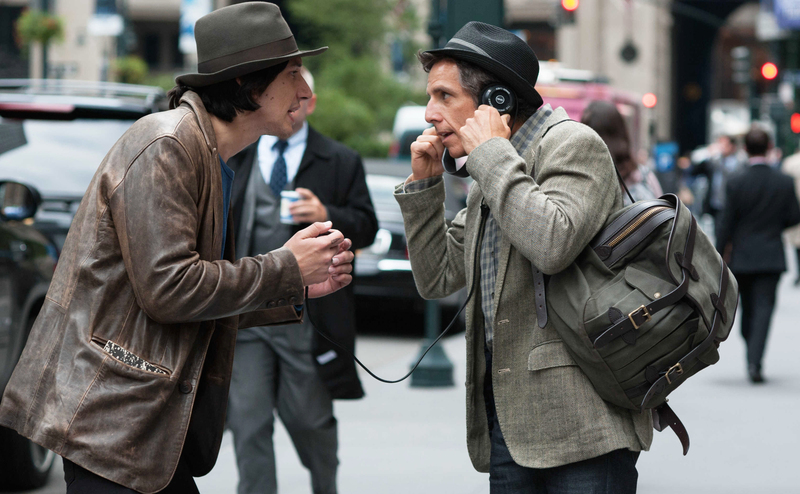 Baumbach suggests the older generation have earned their success but are too dependent on modern technology, and that the younger generation’s appropriation of retro accessories is rooted in their sense of entitlement. These contrasting lifestyles come with corresponding musical cues. Middle age is associated with’s baroque-period strings and youth is matched with James Murphy’s analog synth melodies. The keyboards feel freer than the violins, and oxymoronically, more organic. This dichotomy grows murkier as the cool kid affectations start to rub off on Josh and Cornelia. Darby brings Cornelia to her hip-hop dance class while Jamie introduces tweed, a fedora and chic glasses to Josh’s wardrobe—both yield hilarious results. Yet this glossy stylistic coat of paint only goes so far. Josh and Jamie’s eventual conflict exposes Baumbach’s thesis. The director is concerned with authenticity. Neither couple is comfortable in their own skin; their possessions and clothes are a mask covering up who they really are. And in the writer/director’s capable hands, these painful truths earn hearty laughs. Late in the film, Josh and Jamie attend a Lincoln Center tribute to Josh’s successful filmmaker father-in-law (Charles Grodin). There, a private discussion about ethics in documentary filmmaking leads to a clash of ideals. As Grodin’s character delivers a speech about honest filmmaking, Baumbach intercuts his words with Jamie and Josh’s confrontation. Josh believes in a fervent adherence to truth and reality, but Jamie is comfortable fabricating some of his “truth” in order to boost entertainment value. Synthesizers reemerge beneath their dialogue and rumble in deep, melancholically pensive tones. Here the inorganic music represents something new; instead of youth, it is linked to genuineness. This adds emotional heft to Josh’s enlightened commitment to integrity while Jamie dismisses his criticism. Complicating this musical relationship shines more light on Baumbach’s philosophy. The film suggests that Jamie’s loose and eccentric way of life, his youthful hodgepodge of uniquely cultured experiences, is only a façade. The film’s satire hits hardest when the other characters shrug Josh off when he demands that Jamie admit fraudulence. Josh’s authenticity ultimately earns the director’s sympathy, as evidenced by the repurposed synthesizer cues. While We’re Young presents true and false authenticity set at odds. The film fiercely condemns those who experience life through technology or fashion. Baumbach posits that growing up, accepting one’s place in the world and maintaining a surprising and satisfying existence are more important. With unflinching bluntness and humor, the director emphasizes that our lives—regardless of what we choose to fill them with—must be lived honestly. This article was published in its original form in The Massachusetts Daily Collegian on April 30, 2015.